If you are looking for a fun way to celebrate the Chinese New Year and Valentine’s Day (both on the same day this year) give these fortune cookies a try! Before starting the cookies make slips of paper to fill the cookies. Simply download, print and cut the paper into strips. This simple recipe is adapted from Paula Deen. The butter or oil that is normally found in other fortune cookie recipes is missing, but I figured if Paula leaves out the butter it must be okay! 1) Place egg whites in a bowl and beat with electric mixer on medium speed until very frothy, almost soft peaks. 3) Add sugar, almond, and vanilla then mix. 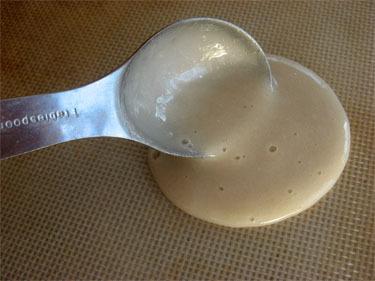 4) Stir in 2 tablespoons of water to thin batter. 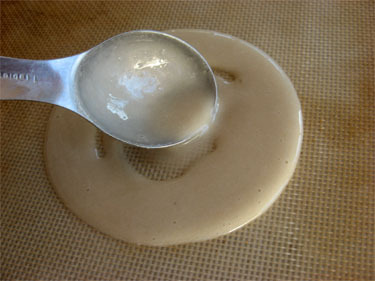 6) Working from the center in a circular motion, spread the batter into a 5 inch circle. 7) Start with two cookies. Once comfortable with the process more can be baked at one time. I was only able to ever bake two at a time. I used two pans and staggered the baking time so I had time to form the cookies. 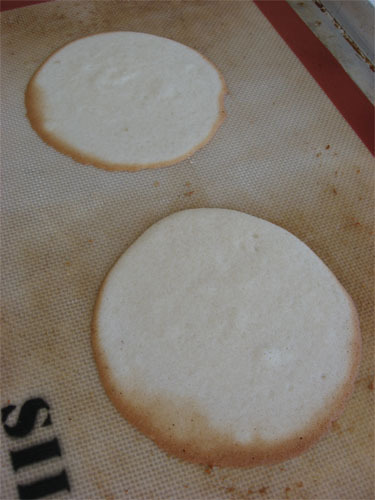 8) Bake until edges are lightly browned. Mine baked for 6 minutes. Start watching closely at 4 minutes. 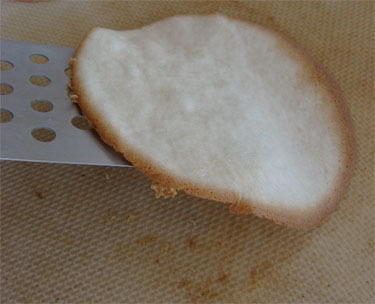 9) Working quickly, remove cookie from pan with a very thin spatula. 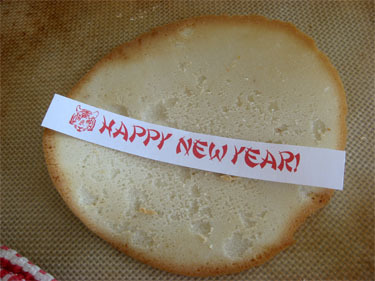 10) Flip the cookie over and place slip of paper on top. 11) Bring sides up and pinch together. 12) Next bend cookie over the edge of a cup. The whole process of forming the cookie should take about 10 seconds. Once formed place cookies in a muffin tin to help them keep their shape while cooling. and you have a sweet way to celebrate! NOTE: The cookies are VERY hot. It is easy to burn fingers on the cookies as they are being formed. Try wearing thin white gloves to protect fingers. I *love* this. I am always looking for ways to make things from scratch that people never make from scratch. 🙂 This is totally next on my list! I can’t wait to try it! oh sister! I’m all over this! thanks! Thanks so much! What fun to learn how to make these fun treats. Sweet! I have a fortune cookie recipe that I’ve used before but I’m pretty sure it calls for butter or oil, so I’ll have to try this one. The pics are wonderful for explaining all the steps Thanks! do you know if i can just substitute more vanilla x instead of the almond? my son has allergies and reacts to this. please say yes! i imagine the only thing it would change would be the flavor, right? So stinkin’ cute! Thanks for the dowloadable slips, too – very handy! FYI, the links are actually backwards: click Valentines for New Years & vice versa. Editor: Thanks for catching that. Will fix now. Aimy, I tried it will subbing all vanilla, and made it too sweet!! LOL I would say make it 3/4 tsp vanilla and then 3/4 tsp water?? Anyone else have suggestions? Can this be done with just parchment paper rather than a silpat??? Can’t wait for Chinese night! These are fabulous! 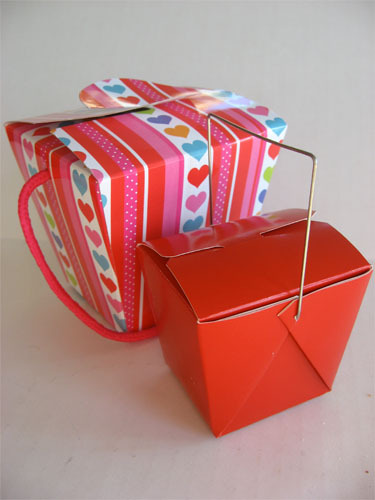 I had red take out boxes left over from Christmas and was trying to think what to do! ok- so we’re ready to make them. What’s the oven temp? Did I just read over it? What temperature do you cook these on? Did I miss it? Thanks so much for posting these! 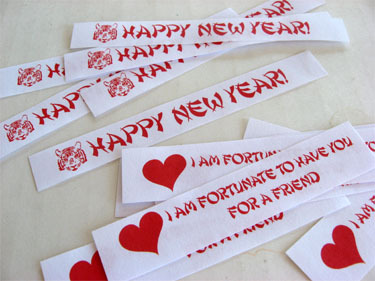 My daughter is adopted from China and her teacher is letting me do a little Chinese New Year lesson and these are the perfect thing to make for her classmates at preschool. I love that they will work for her Valentines too! Stephanie… Thanks! I’ll see what I can come up with. 🙂 They are so darn cute that I may just go all vanilla. Aimy, let me know what you come up with 🙂 I am going to try experimenting some more! Thank you SO MUCH for this great idea! I am always looking for fun ideas as gifts for teachers/bus drivers for my kids! We did homemade marshmallows for Christmas. I think we’ll make these for Valentine’s Day. I’ll blog about these when we make them and add a link to your blog for sure! This idea is really cute! I think it is so unique and will definitely refer to your blog on my own! I am so glad I found this recipe! I am bookmarking it for sure! i can’t wait to make these. these would be so cute to send to school with your kids and put a sweet little note in them…love it! omg! Looove it! I can’t wait to make these for my kids. I think I may make them when they are not around and slip fortunes that are just for each of them… and then not let them know that I took part in the making. Too funny to see them be shocked at how accurate their fortunes are. 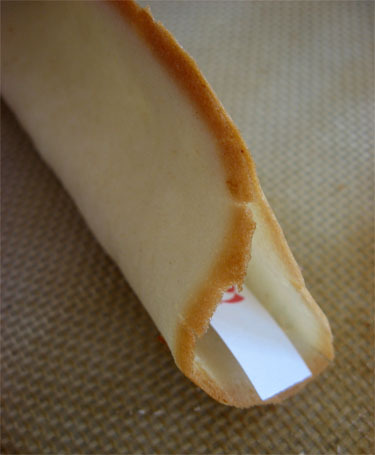 Thanks for your recipe, i just made my first bunch of fortune cookies =) had to add a little more water, but maybe i just miscalculated when converting to metric units 😉 and instead of the almond extract i used vanilla only and it tasted great! We made them and they turned out great. I blogged about them and my egg drop soup here. 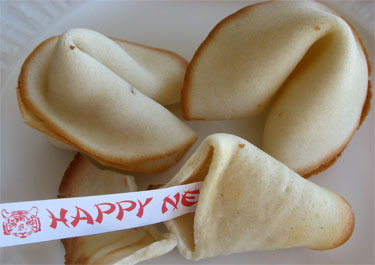 http://mamabeefromthehive.blogspot.com/2010/01/fortune-cookies-and-egg-drop-soup.html thanks! 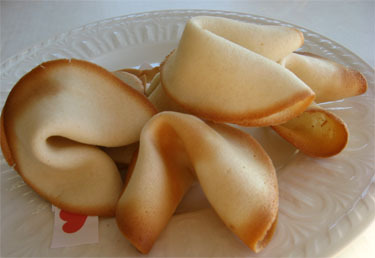 Whoa, you made your own fortune cookies? That is amazing! There are endless possibilities for sweet notes that you could put inside, what a great idea! I’m going to try making these next week with my sons. Thanks for the awesome idea. 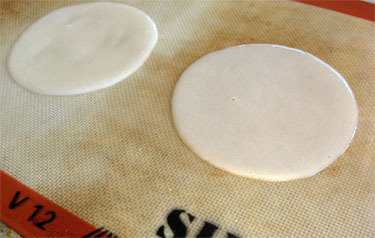 I wonder if I could use a pampered chef baking stone instead of the parchment paper or Silpat mat? Does anyone know? Thanks for a great new idea! 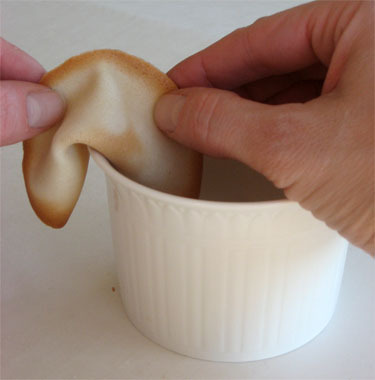 Do the fortune cookies freeze well. We just made them – they are so cute, though a bit difficult to get off the parchment paper. We really need them for something in two weeks and want to know if they would freeze (and defrost) well. I used a nonstick cookie sheet and mine stuck horribly. I ended up spraying pam on a paper towel and rubbing just a tiny bit on the cookie sheet and they popped right up! Also only cooked mine for 4 minutes!